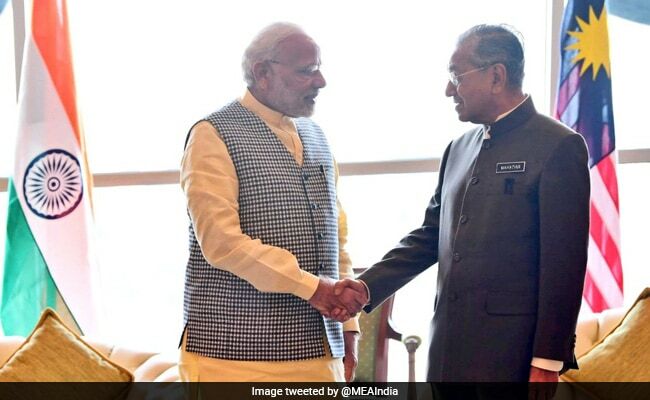 PM Modi, who arrived in Kuala Lumpur today on the second leg of his three-nation tour, met Prime Minister Mahathir at his office in the Perdana Putra Complex, Putrajaya. "The two leaders had a productive exchange of views on strengthening our strategic partnership, and PM congratulated Dr. Mahathir on taking over the post of Prime Minister of Malaysia," tweeted Foreign Ministry spokesman Raveesh Kumar. 0 after leading the opposition alliance to an overwhelming electoral victory over the Barisan Nasional Coalition, which had ruled Malaysia since 1955. Earlier, the Prime Minister's Office said, PM Modi will talk about aspects of Indian-Malaysian cooperation with Prime Minister Mahathir. "Malaysia is a strategic partner and a focal country our file Ostpolitik, "said Mr. Kumar. Prime Minister Modi announced in New Delhi that he would stop briefly in Malaysia on his way to Singapore to meet with Prime Minister Mahathir and congratulate the new Malaysian leadership] Prime Minister Modi will travel from Kuala Lumpur to Singapore, where He will deliver a keynote speech tomorrow at the annual Shangri-La Dialogue, an annual security conference.